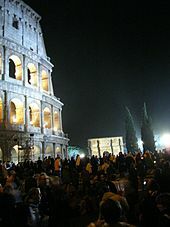 Passover, Christmas (which celebrates the birth of Jesus), Septuagesima, Quinquagesima, Shrove Tuesday, Ash Wednesday, Lent, Palm Sunday, Spy Wednesday, Maundy Thursday, and Holy Saturday which lead up to Easter, Easter Sunday (primarily), Ascension, Pentecost, Whit Monday, Trinity Sunday, and Corpus Christi which follow it. It is related to the Feast of the Exaltation of the Holy Cross, which focuses on the benefits, graces, and merits of the Cross, rather than Jesus's death. 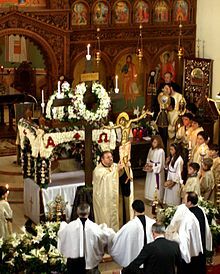 Members of many Christian denominations, including the Anglican, Catholic, Protestant, Eastern Orthodox, Lutheran, Methodist, Oriental Orthodox, and Reformed traditions, observe Good Friday with fasting and church services. A common folk etymology claims "Good Friday" is a corruption of "God Friday", as was the case with the contraction goodbye. The term in fact comes from the sense "pious, holy" of the word good. The Oxford English Dictionary also gives other examples with the sense "of a day or season observed as holy by the church" as an archaic sense of good (good, adj. 8c) as in good tide meaning "Christmas" or "Shrove Tuesday", and Good Wednesday meaning the Wednesday in Holy Week. The Baltimore Catechism states that this day is called "Good Friday" because Jesus "showed His great love for man, and purchased for him every blessing". In Dutch Good Friday is known as Goede Vrijdag, in Frisian as Goedfreed. In German-speaking countries, Good Friday is generally referred to as Karfreitag (Kar from Old High German kara‚ "bewail", "grieve"‚ "mourn", Freitag for "Friday"): Mourning Friday. The Kar prefix is a cognate of the English word "care" in the sense of cares and woes; it meant mourning. The day is also known as Stiller Freitag ("Silent Friday") and Hoher Freitag ("High Friday, Holy Friday"). In the Nordic countries it is called "The Long Friday". 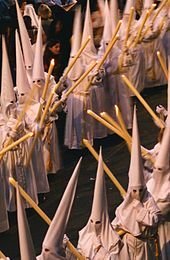 In Greek, Polish and Hungarian, Good Friday is generally referred to as Great Friday (Μεγάλη Παρασκευή, Wielki Piątek, Nagypéntek). 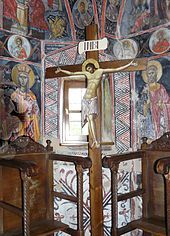 In Bulgarian, Good Friday is called either Велики петък – Great Friday, or, more commonly, Разпети петък (approximate pronunciation 'razpeti petak') which literally translates to "Crucified Friday". John 13:31–18:1 – Christ's last sermon, Jesus prays for the apostles. John 18:1–28 – The agony in the garden, the mockery and denial of Christ. Matthew 26:57–75 – The mockery of Christ, Peter denies Christ. 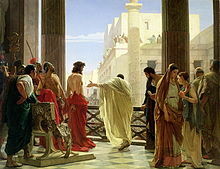 John 18:28–19:16 – Pilate questions Jesus; Jesus is condemned; Jesus is mocked by the Romans. Matthew 27:3–32 – Judas commits suicide; Jesus is condemned; Jesus mocked by the Romans; Simon of Cyrene compelled to carry the cross. Mark 15:16–32 – Jesus dies. Matthew 27:33–54 – Jesus dies. Luke 23:32–49 – Jesus dies. John 19:25–37 – Jesus dies. Mark 15:43–47 – Joseph of Arimathea buries Christ. John 19:38–42 – Joseph of Arimathea buries Christ. Matthew 27:62–66 – The Jews set a guard. The Three Hours' Devotion based on the Seven Last Words from the Cross begins at noon and ends at 3 pm, the time that the Christian tradition teaches that Jesus died on the cross. More recently, Lutheran liturgical practice has recaptured Good Friday as part of the larger sweep of the great Three Days: Maundy Thursday, Good Friday, and the Vigil of Easter. 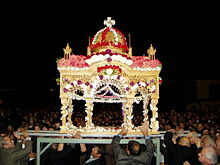 The Three Days remain one liturgy which celebrates the death and resurrection of Jesus. As part of the liturgy of the Three Days, Lutherans generally fast from the Eucharist on Good Friday. Rather, it is celebrated in remembrance of the Last Supper on Maundy Thursday and at the Vigil of Easter. One practice among Lutheran churches is to celebrate a tenebrae service on Good Friday, typically conducted in candlelight and consisting of a collection of passion accounts from the four gospels. While being called "Tenebrae" it holds little resemblance to the now-suppressed Catholic monastic rite of the same name. The Good Friday liturgy appointed in Evangelical Lutheran Worship, the worship book of the Evangelical Lutheran Church in America, specifies a liturgy similar to the revised Roman Catholic liturgy. A rite for adoration of the crucified Christ includes the optional singing of the Solemn Reproaches in an updated and revised translation which eliminates some of the anti-Jewish overtones in previous versions. 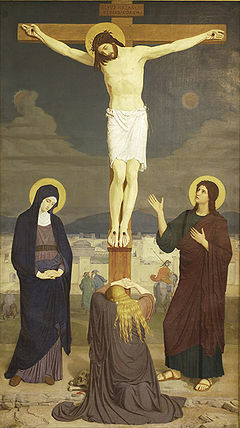 Many Lutheran churches have Good Friday services, such as the Three Hours' Agony centered on the remembrance of the "Seven Last Words," sayings of Jesus assembled from the four gospels, while others hold a liturgy that places an emphasis on the triumph of the cross, and a singular biblical account of the Passion narrative from the Gospel of John. Many other mainstream Protestant communities hold special services on this day as well. Moravians hold a Lovefeast on Good Friday as they receive Holy Communion on Maundy Thursday. 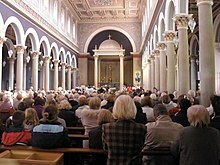 Some Methodist denominations commemorate Good Friday with fasting, as well as a service of worship based on the Seven Last Words from the Cross; this liturgy is known as the Three Hours Devotion as it starts at noon and concludes at 3 pm, the latter being the time that Jesus died on the cross. It is not uncommon for some communities to hold interdenominational services on Good Friday. In many countries with a strong Christian tradition such as Australia, Bermuda, Brazil, Canada, the countries of the Caribbean, Chile, Colombia, Costa Rica, Czech Republic, Ecuador, Finland, Germany, Hungary, Malta, Mexico, New Zealand, Peru, the Philippines, the Scandinavian countries, Singapore, Spain, Switzerland, the United Kingdom, and Venezuela, the day is observed as a public or federal holiday. 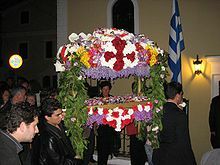 In the United States, 12 states observe Good Friday as state holiday: Connecticut, Texas, Delaware, Hawaii, Indiana, Tennessee, Florida, Kentucky, Louisiana, New Jersey, North Carolina and North Dakota. One associated custom is strict adherence to the Black Fast to 3pm or 6pm, where only water can be consumed or restricted handout of bread, herbs and salt. St. Ambrose, St. Chrysostom and St. Basil attest to the practice. The processions of the day, hymns “Crux fidelis” by King John of Portugal, and Eberlin’s “Tenebrae factae sunt, followed by “Vexilla Regis” is sung, translated from latin as the standards of the King advance, and then follows a ceremony that is not a real Mass, it is called the “Mass of the Pre-Sanctified.". 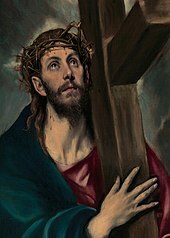 This custom is respected also by forgoing the Mass, this is to take heed to the solemnity of the Sacrifice of Calvary. This is where the host of the prior day is placed at the altar, incensed, elevated so "that it may be seen by the people" and consumed. Germany and some other countries have laws prohibiting certain acts, such as dancing and horse racing, that are seen as profaning the solemn nature of the day. Hot cross buns are traditionally toasted and eaten on Good Friday in Britain, Canada and Australia. Some Baptist congregations, the Philadelphia Church of God, and some non-denominational churches oppose the observance of Good Friday, regarding it as a papist tradition, and instead observe the Crucifixion on Wednesday to coincide with the Jewish sacrifice of the Passover Lamb (which some/many Christians believe is an Old Testament pointer to Jesus Christ). 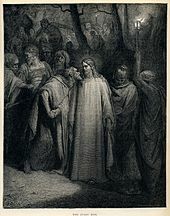 A Wednesday Crucifixion of Jesus allows for him to be in the tomb ("heart of the earth") for three days and three nights as he told the Pharisees he would be (Matthew 12:40), rather than two nights and a day (by inclusive counting, as was the norm at that time) if he had died on a Friday. 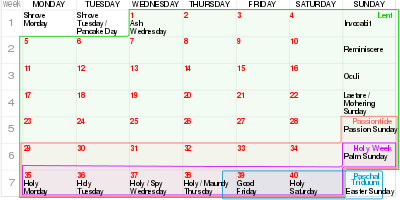 Preparation Day (14 Nisan on the Hebrew calendar) – which is the day before Passover (15 Nisan), instead of the Friday morning as the Synoptic Gospels refer to the sabbath and they believe this refers to a "high sabbath" which occurs on feast days, and not the ordinary weekly sabbath. ^ Ripley, George; Dana, Charles Anderson (1883). The American Cyclopaedia: A Popular Dictionary for General Knowledge. D. Appleton and Company. p. 101. The Protestant Episcopal, Lutheran, and Reformed churches, as well as many Methodists, observe the day by fasting and special services. ^ a b Pfatteicher, Philip H. (1990). Commentary on the Lutheran Book of Worship: Lutheran Liturgy in Its Ecumenical Context. Augsburg Fortress Publishers. pp. 223–244, 260. ISBN 978-0800603922. The Good Friday fast became the principal fast in the calendar, and even after the Reformation in Germany many Lutherans who observed no other fast scrupulously kept Good Friday with strict fasting. ^ a b Jacobs, Henry Eyster; Haas, John Augustus William (1899). The Lutheran Cyclopedia. Scribner. p. 110. By many Lutherans Good Friday is observed as a strict fast. The lessons on Ash Wednesday emphasize the proper idea of the fast. The Sundays in Lent receive their names from the first words of their Introits in the Latin service, Invocavit, Reminiscere, Oculi, Lcetare, Judica. ^ "Why is Good Friday called Good Friday?". BBC. 18 April 2014. Retrieved 18 April 2019. ^ a b Bulgakov, Sergei V. (1900). "Great Friday". Handbook for Church Servers (PDF) (2nd ed.). Kharkov: Tr. Archpriest Eugene D. Tarris. p. 543. Retrieved 6 April 2015. ^ Archimandrite Kallistos (Ware) and Mother Mary (2002). "Service of the Twelve Gospels". The Lenten Triodion. South Cannan, PA: St. Tikhon's Seminary Press. p. 587. ^ "Good Friday – Easter/Lent". Catholic Online. 12 January 2018. ^ "V. Good Friday". The Catholic Liturgical Library. Retrieved 28 July 2018. ^ Robert Barron. "Tre Ore - The Three Hours' Agony". Word on Fire. Retrieved 18 April 2019. ‘The Three Hours' Agony’ or Tre Ore is a liturgical service held on Good Friday from noon until 3 o'clock to commemorate the Passion of Christ. Specifically, it refers to the three hours that Jesus hung on the Cross and includes a series of homilies on the seven last words spoken by Christ. ^ "Reparation". Catholic Encyclopedia. Retrieved 17 April 2017. ^ "Raccolta". Catholic Encyclopedia. Retrieved 17 April 2017. ^ a b Gassmann, Günther; Oldenburg, Mark W. (2011). Historical Dictionary of Lutheranism. Scarecrow Press. p. 229. ISBN 978-0810874824. In many Lutheran churches, the Sundays during the Lenten season are called by the first word of their respective Latin Introitus (with the exception of Palm/Passion Sunday): Invocavit, Reminiscere, Oculi, Laetare, and Judica. Many Lutheran church orders of the 16th century retained the observation of the Lenten fast, and Lutherans have observed this season with a serene, earnest attitude. Special days of eucharistic communion were set aside on Maundy Thursday and Good Friday. ^ Bays, Daniel H; Wacker, Grant (2010). The Foreign Missionary Enterprise at Home: Explorations in North American Cultural History. University of Alabama Press. p. 277. ISBN 978-0817356408. ^ The United Methodist Book of Worship: Regular Edition Black. United Methodist Publishing House. 2016. p. 365. ISBN 978-1426735004. ^ "The Black Fast". Catholic Encyclopedia. ^ "Public holidays and anniversary dates". NZ Government. Retrieved 17 March 2018. ^ "Good Friday Music – Dictionary definition of Good Friday Music". Encyclopedia.com: FREE online dictionary. Retrieved 17 April 2017.